These are three more releases in EMI's "Classic Archive" series of DVDs. Access to the archives of the BBC (Great Britain) and the INA (France) has made these treasures available to new generations of music-lovers, who are much richer as a result. 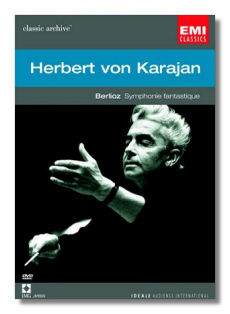 Later in his career, Herbert von Karajan became almost fanatical about leaving video documents of his conducting. In 1970, when this Symphonie fantastique was recorded in a Paris studio, in color, by director Roger Benamou, the conductor was in the relatively early stages of experimenting with the medium. Ideas that would be expanded upon in the later 1970s and in the 1980s appear in basic form here: the almost painterly composition of images on the screen, silhouetting and other dramatic lighting effects, and close-ups that fragment the instruments, turning them into insects or strange implements of torture. (Appropriate, given the music!) Musicians' faces are seldom seen, although we often see Karajan's face – eyes closed. (All the better to hear you with, my dear!) Visually, this Symphonie fantastique is a mixture of the compelling, the pretentious, and the nostalgic. 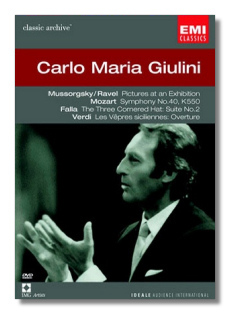 Musically, it is quite impressive, with less gilding of the lily than sometimes happened with Karajan. In fact, in the last movement, the music-making gets a little rough and dirty, and about that I have no complaints. Karajan's manipulative blending and smoothing of orchestral sound is compromised by the microphones and the recording technique; what the conductor might have considered a fault turns out, perhaps, to be an asset. It is doubtful that Karajan would have made a record that sounds like this video, and that's OK! The bonus material is Barbirolli conducting Le Corsaire in Manchester's Free Trade Hall on January 17, 1962. The energetic performance gets two thumbs up, and it is fun to watch the conductor's energetic podium style. In front of him, there is a curious hole in the orchestra – did a piano concerto precede this work? The camerawork is basic, and the images are not highly defined. When the camera pans across the orchestra, the image becomes granular. Not quite four minutes of Guido Cantelli conducting the La Scala Orchestra in Rossini's Semiramide overture is the tantalizing bonus. Although this is rehearsal footage, it consists of the last section of the overture, uninterrupted. The sound and picture are primitive – this excerpt is from Edinburgh in1950 – but nothing obscures the driven, white-hot musicianship. What a tragedy it was for the music world when Cantelli was killed in a plane crash a few years later! Another style of conducting is exemplified by André Cluytens on the third DVD. Every gesture and expression expresses the joy that he felt in making music. Like his countryman Pierre Monteux, he was among the most elegant of conductors, with a clear stick technique and an unbroken channel of communication between him and the orchestra members. The suite from Daphnis is lithe and exciting. 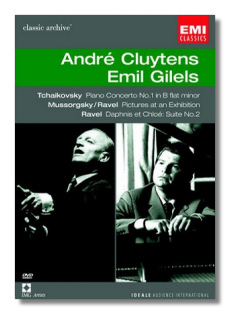 Cluytens, so well attuned to both the music of Ravel and Mussorgsky, was a unique interpreter of the former's orchestration of Pictures at an Exhibition. Gallic wit and subtlety are perfectly married to Russian soul in this performance. The nasal, vibrato-y French brass instruments are a delight. Daphnis and Pictures were filmed in a Paris studio on August 13, 1960. Unfortunately, the camerawork is directionless at best and inept at worst, and the music's dynamic contrasts have been leveled out by the audio engineer. The live performance of Tchaikovsky's First Piano Concerto from June 19, 1959 both looks and sounds better, occasional instabilities of pitch and image notwithstanding. Gilels plays the solo part thunderously, albeit rather sloppily. Still, it's easy to see where his reputation as an overpowering musician with an awesome technique came from, and no one will complain that this performance is generic; it's got the "wow factor" in spades. The bonus is a London studio reading (from 1959) of Prokofieff's little Piano Sonata #3. Here, Gilels is more controlled, yet the performance lacks nothing in drive and sarcasm.